The Green mage Saisha and Hethan, a master swordsman, find themselves entangled in a dark dame’s spells. They are drawn together at a harvest festival. They free a wounded Prica, a man cursed in the shape of a wolf. Yet neither expects to see the other ever again. 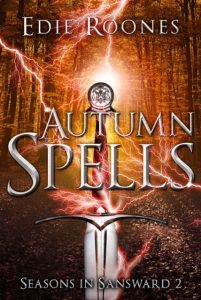 Yet when Hethan returns to his home keep, a dark dame ensorcels him to track down a mage. She wants to reincarnate herself in the mage’s younger body. The dame’s dark spells bring them back together. Can Saisha disentangle Hethan from the sorcery? Or will she be trapped and turned into a wraith while the dark dame inhabits her body?